Victoria and others have asked how to open the Sunrider portion of the Jeep soft top — so you’re riding around as if you have the sunroof open (rather than lowering the entire soft top on your Jeep). This is actually something that can be done by one person alone. It only takes me about 4 minutes to do it myself. It’s even quicker with 2 people! Step #1 Un-hook the thick plastic rain guards (officially they’re the “drip rail retainers”) that are built into your Jeep’s soft top. They are shaped such that they grip right over and around the black metal channel above your passenger and driver side windows. Step #3 There is one black metal latch above each visor — unclamp each one. 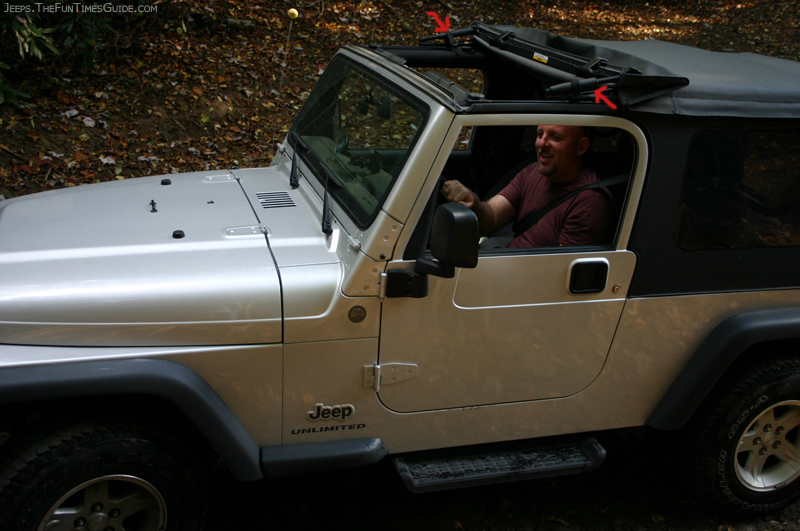 To prevent those header latches from re-attaching on your Jeep’s frame as you’re trying to lift the Sunrider top (especially if you’re doing this as a 1-person project), close each latch into itself. (That will make more sense when you’re actually looking at the latch, rather than reading about it here.) In effect, clamping it into itself makes it smaller, and less likely to “catch” on your Jeep’s frame as you’re raising the Sunrider top up. Step #4 As you pull the Sunrider portion of your soft top back toward the middle of your Jeep, do this one thing: only take it halfway at first! Why? Because that enables you to properly “fold” and flatten the Sunrider material — such that when you take it the rest of the way, it will be “folded” into halves neatly — with the outer side facing the sky. If you attempt to take the Sunrider top back in one motion, rather than 2 (without folding it in half), then you’ll end up with too much soft top material flopping in the wind atop your Jeep. It’s actually a very natural motion… as you’re lifting the Sunrider top halfway up, you’ll notice that the side bars start to bend at that middle joint. THAT’s where you pause to flatten out the first half of your Sunrider top. Then, go the rest of the way, and the bottom half of the Sunrider top will rest nicely on top. NOTE: The thicker parts of those black bars serve as braces when the Jeep’s Sunrider top is “down” and serving as a solid roof. They serve no meaningful purpose when the Sunrider top is “open”. I say that, because we wondered for the longest time if we were supposed to pull ’em or push ’em or position them in any particular way. The answer is: No. Don’t worry about them, they just fall into place. Step #5 I’m not sure how important this next step is, but it makes things neat & tidy, so we do it every time. When your Sunrider top is open, those thick black latches for your soft top are now facing the sky, and they’re probably just dangling there. Take the extra second to make that clamp actually latch onto the opened top-side of your Sunrider top. There is an oval-shaped cut-out right there where they clamp can rest… just open the clamp, then position it over that oval cut-out, and close the clamp so it stays in place while you’re riding around. Jim and I actually stop right there. But technically, there is one more step. Step #6: You’re supposed to use the black straps that came with the Jeep to “tie down” the Sunrider top — so it won’t flop around too much at excessive speeds or when you’re faced with crosswinds from a passing truck, etc. Just wrap those straps around the frame of your Jeep (above the drivers window and above the passenger window) and around those black metal bars that you used to lift the Sunrider top up and back. There is no single “right” way to do this, you’re simply trying to avoid too much “floppage”. Now, put your visors back into place, and you’re ready to roll! 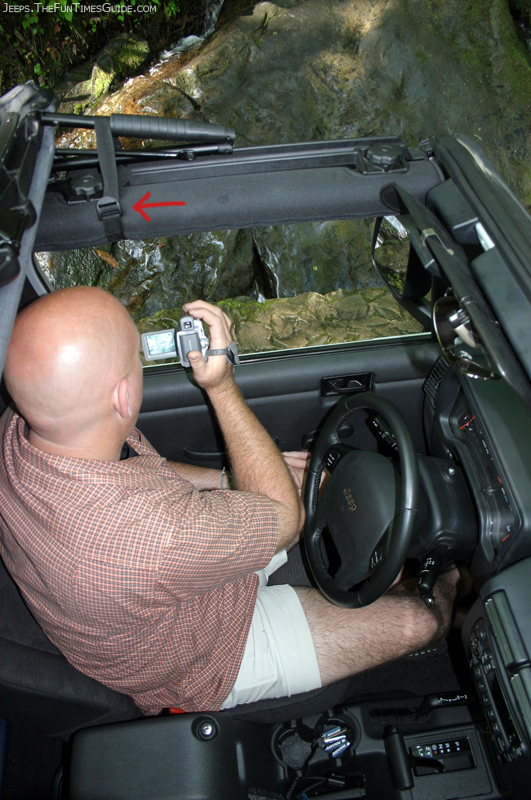 BONUS TIP: When you’re riding around in your Jeep with the Sunrider top open, you should make a point to also open the rear window of your Jeep, or one (or more) of the driver/passenger side windows. Otherwise, you create too much of a vacuum inside the Jeep. That’s not good. As a reminder, the above steps are the ones Jim and I use with our 2004 Jeep Wrangler Unlimited.